Vorsprung durch Technik. First used by Audi (for NSU) 40 years ago, this slogan envelops much more than just a catchy advertising tag line. 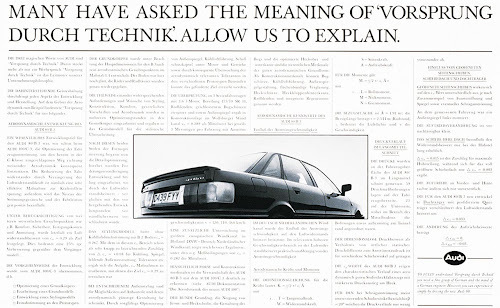 Roughly translated as "advancement through technology," Audi explains: "These words stands for everything we do. It is the high level of technology that gives Audi an advantage, and the passion for developing better technologies is what keeps us going."